Grass Valley, Calif. April 16, 2019 – Nevada County Arts Council invites the community to a significant meeting on Thursday April 18 at 5pm at the Rood Center in Nevada City. At this time, in partnership with Americans for the Arts, the key findings of Nevada County’s first comprehensive economic impact study of the arts will be shared, followed by a Toast to the Arts in the lobby. 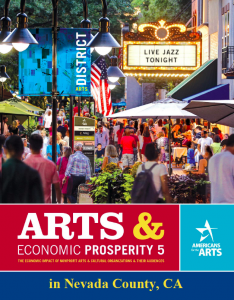 Joining Nevada County Arts Council will be Randy Cohen, Vice President of Research and Policy at Americans for the Arts, the largest national advocacy organization in the United States. Randy will fly from Washington DC to help deliver key findings and explain the study’s rigorous methodology. Cohen will arrive in time for meetings with key stakeholders, such as the Cities of Grass Valley and Nevada City, the Town of Truckee, and Nevada County Economic Resource Council’s Executive Committee. The following week, on April 23, Cohen will be attending California’s Arts Advocacy Day at the State Capitol in Sacramento. This important day will see hundreds flocking to the Capitol in support of the arts and creativity in California. Nevada County Arts Council and its partners, as well as Americans for the Arts welcomes the public during California’s inaugural Arts, Culture & Creativity Month at this important public launch, to learn more about how the arts create jobs, generate commerce and drive tourism in Nevada County. Learn more about arts advocacy at Nevada County Arts Council at nevadacountyarts.org/arts-culture-creativity-month where you will find important links and ways to connect!